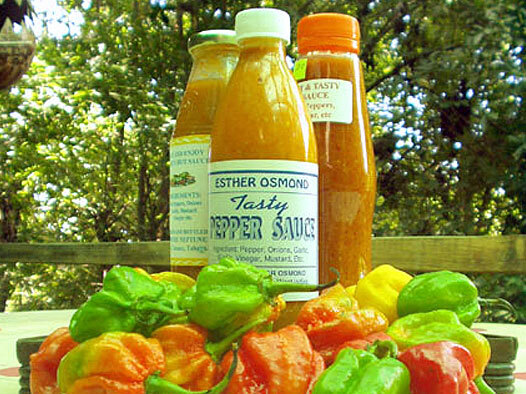 November - Hot pepper sauce! It’s what Caribbean food is all about! Peppers burn, do not put your fingers near your eyes until fingers have been thoroughly washed. Check peppers for bad spots and peel garlic. Blend all the ingredients in a blender and pour into a clean bottle. To aid preservation a little hot oil can be added to sauce by pouring it on top of sauce in the bottle. The consistency can be altered by adding more vinegar or boiled water. Sort and wash peppers. Blend with peeled garlic, salt and water but NOT limes. Cut limes, preserving all juice, into very thin slices removing all pips. Add limes and juice to pepper sauce and bottle. Over time the pepper and lime will blend giving this sauce an added piquancy. November is a rainy month, so what better to do than stay home and have a traditional Sunday lunch. Which must include Macaroni Pie and Callalloo, the latter being the leaves of the Dasheen plant cooked with Ocroe and Coconut milk. And the meat could well be smoked and stewed Yardie chicken, those apparently wild chickens that thrive on goodness knows what and wander the town and country in search of food.